We recently moved into a house from an apartment. I love my new digs. This place is much larger, and so, I’ve had fun buying some additional furniture at second hand stores. It is a one story, called a ranch, with a two car garage and a fenced back yard. I love to sit on the front porch protected by trees and read sipping tea or coffee. 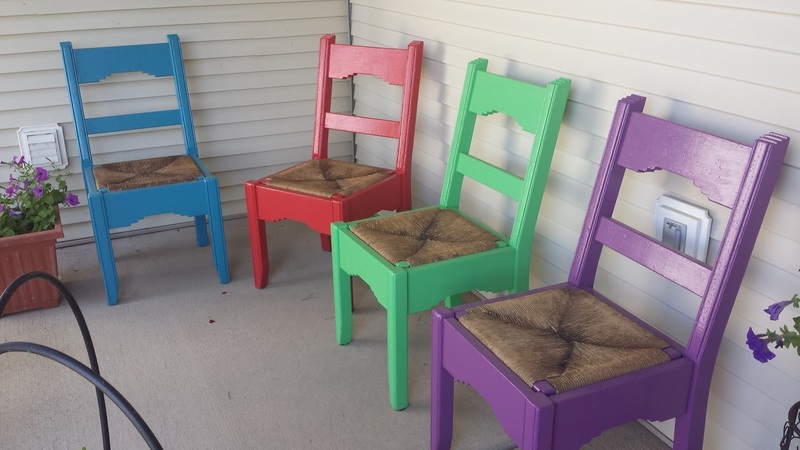 Some old chairs caught my eye at a second hand store, and I gave them a bright facelift in vibrant colors. I have a room for an office where I can let my imagination take flight, with no interruptions. In this house, I can sing out loud and not worry I’m bothering the neighbors. The neighborhood is a nice quiet one where walking the streets is enjoyable. In our back yard are many trees. 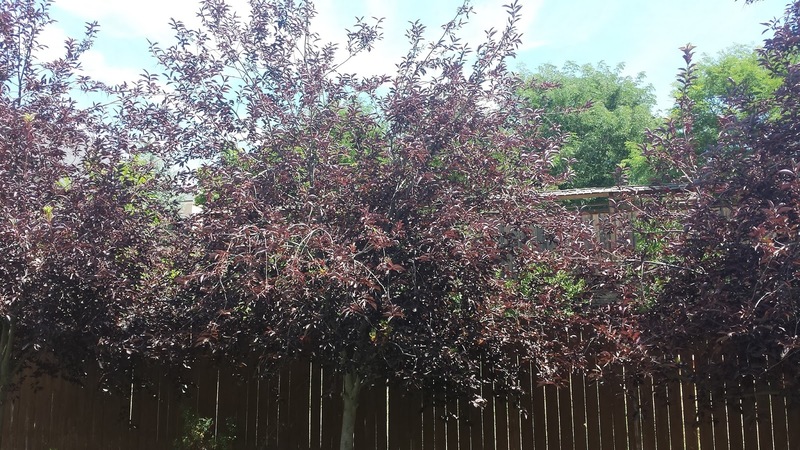 Three of the trees have dark burgundy leaves and a few weeks ago was burdened with a bazillion berries. The birds discovered them and for three days devoured them. I loved watching them through our huge window. Some birds hung upside down to pick off the berries. The frenzy was intense. The birds were afraid they wouldn’t get their fill. Flying here and there, swarming and swooping all around the yard. Unfortunately, some hit our window thinking the reflection was more berry laden trees. I turned the vertical blinds so we could see out but it distorted the reflection enough to keep the birds from breaking their necks. The birds made me think of gluttons who seem to feel they need more and more and are never satisfied. They grab food and devour it so fast almost afraid someone will take it away from them. I want to be thankful for my food and content with a portion I need to sustain me but not to overdo it. The Bible warns against gluttony. Proverbs 23:1 b-2 Consider carefully what is before you; and put a knife to your throat if you are a man given to appetite. That seem pretty harsh. What it means is to think about what you put into your mouth and beware lest you become a glutton. Another bird I like to watch is the humming bird. 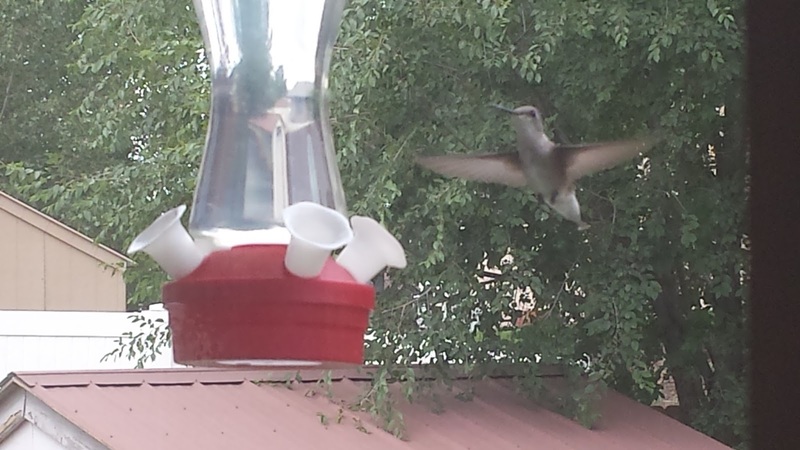 For the first time in my life I put up a humming bird feeder. They love my simple sugar concoction. The humming bird is like a helicopter, in the fact that they hover. Their little wings beat 50 time a second and can fly as fast as 35 miles an hour! Wow! They are also pretty too. The bees also enjoy the feeder. A wasp has started to drink the nectar but is not wanting to share. He chases away the humming birds. This is silly because there are four places to drink from. He is acting like a glutton. A week ago I had surgery on my nose. It was broken a while back and an infection had developed that would not go away. The surgery lasted an hour but the healing process will take some time. During the first week of recovery, I was glad to sit on my sofa and watch these amazing birds. It gave me pleasure. I love God’s creation. The Lord is creative. God made a world full of wonderment for our enjoyment. We have many kinds of animals, birds, fish, reptiles, and insects to observe. They are full of colors and delightful attributes. All creation points to the Lord as their creator. Psalm19:1 The heavens declare the glory of God; and the firmament shows His handy work. We should be thankful and content where the Lord has put us. Wherever or whatever your circumstances, please thank the Lord, and be content. We also should not become gluttons but thankful for our daily bread for our needs. I thank the Lord for giving us a beautiful world to live where we can enjoy his creation. I feel blessed to be able to spend time with you each week, telling you stories from my mind, and retelling of people in time past from the Bible. The Lord put on my heart this wonderful enjoyment of teaching godly principles to you, the reader. I hope these lessons I write every week touch your heart in the way they are intended. God bless you. Proverbs 23:1 b-2 Consider carefully what is before you; and put a knife to your throat if you are a man given to appetite. Psalm19:1 The heavens declare the glory of God; and the firmament shows His handy work.